This is how you find our house. Hechingen is located approx. 50 km south of the befindet sich ca. 50 km south of the regional capital Stuttgart of the country Baden-Wuerttemberg at through road B 27 between Tuebingen and Balingen. 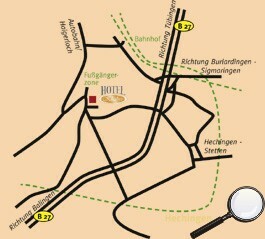 Our house is centrally situated directly at Obertorplatz in Upper Hechingen (Oberstadt). towards Hechingen centre. At the end of the major road you will find Obertorplatz.